keeping track of 140 something peace signs is no small task. I am a little under halfway through the year and it’s been my experience that peace is harder to maintain than to make. I have peace debris all over the lawn. There are sticks and rocks in the yard making it hard to walk and harder to mow. In order to help bring order to this chaos my friend Michelle came over and tamed an overgrown flower bed. 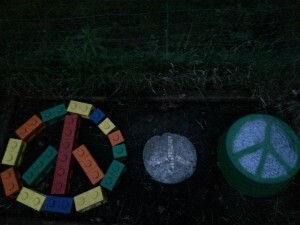 I moved 3 peace’s to the flower bed and made a peace garden. Jess, the dogs and the neighbors will be happy that I can mow again.